The Daily Bluapple: Storing Fresh Fruits and Vegetables for Better Taste. Storing Fresh Fruits and Vegetables for Better Taste. The following information is provided on a small card inside each package of The Bluapple. If you lose your copy of it however, I thought it would be nice to have it here on the blog to easily and quickly refer to. It basically says that produce will stay the freshest and taste the best when it is stored correctly, with temperature and humidity control (and of course, ethylene gas control with The Bluapple). It lists a suggestion of how to store them and where. 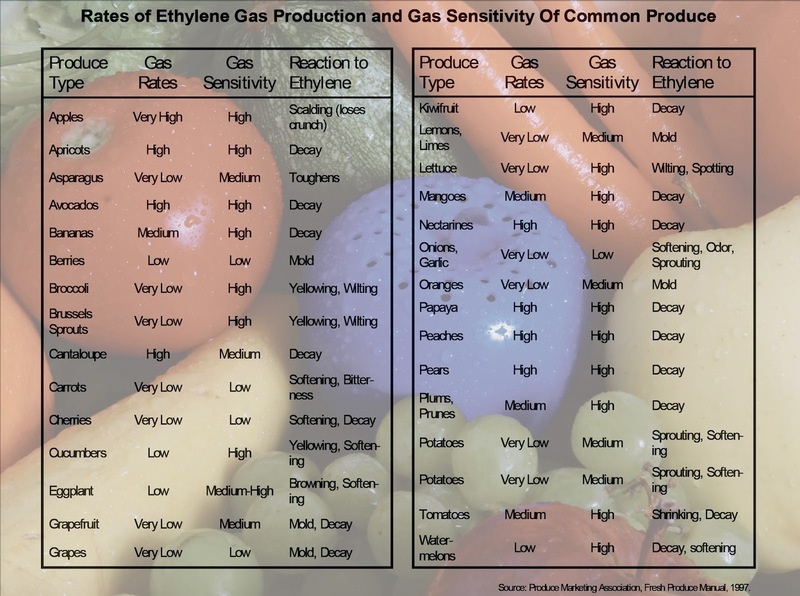 It is also informative in that it shows some of the more commonly used fruits and vegetables and what their sensitivity level is to ethlyene gas. To maintain the freshness and flavor of your produce, it is important to know how to store it at home. Many fruits and vegetables should be stored only at room temperature because refrigerator temperatures (38 to 42 degrees F [3.3 to 5.6 degrees C]) damage them or prevent them from ripening to good flavor and texture. Other produce can be ripened on the counter and then stored in the refrigerator. A few fruits and fruit-type vegetables gain sugar or soften when stored at room temperature. The counter storage area should be away from direct sunlight to prevent produce from becoming too warm. Fruits and vegetables that can be stored at room temperature for a few days without shriveling do not lose moisture rapidly. Even so, moisture loss can be reduced by placing produce in a vented plastic owl or a perforated plastic bag. Do not place produce in sealed plastic bags on the counter because this slows ripening and may increase off-odors and decay due to accumulation of gasses and depletion of oxygen inside the sealed bag. Ripening in a bowl or paper bag can be enhanced by placing one ripe apple with every 5 to 7 pieces of fruit to be ripened. The ethylene gas given off accelerates ripening. Refrigerated fruits and vegetables should be kept in perforated plastic bags in the produce drawers of the refrigerator. You can either purchase perforated plastic bags or make small holes with a sharp object in unperforated platic bags (about 20 holes per medium sized bag). Separate fruits from vegetables (use one drawer for each group) to minimize the detrimental effects of ethylne (produed by the fruits) on the vegetables. Use all refrigerated fruits and vegetables within a few days since longer storage results in loss of freshness and flavor.